When I first heard about this play, I thought, “No way.” For me, perfect films rarely translate well onto the stage. 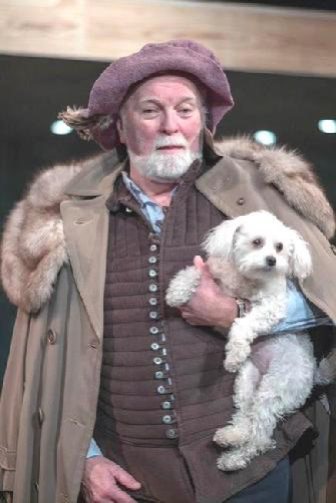 Well, I was wrong in the case of “Shakespeare In Love,” now playing on stage in Albany, New York, at the Capital Repertory Theatre on N. Pearl Street. I will state without explanation or apologies that when a perfect team of actors, directors, musicians, designers and all of their assistants get together to craft a large and complicated play, it’s a bit like knitting: Colorful threads come together with an ideal rhythm and sensibility to create the perfect fabric, tight where it needs to be and loose when that is demanded—a garment so special that you just want to wrap yourself in it, cuddle with it, find its warmth and its depth, and stay there for as long as possible. That describes the production of this play as crafted by director Maggie Mancinelli-Cahill; her excellent group of 24 actors playing more than 30 roles; her support teams of designers, musicians, singers and choreographer; and the sweetest little dog you’ve ever seen. 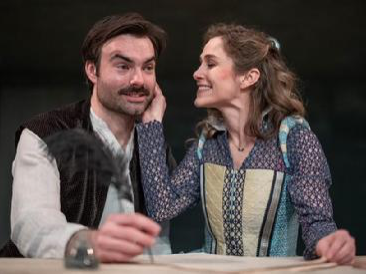 Long married and fed up with it, playwright William Shakespeare, struggling with his new play “Romeo and Ethel, the Pirate’s Daughter,” is an emotional mess. Nothing is working right and the piece, commissioned by actor/producer Richard Burbage, is in horrible shape. Burbage is played with volatility and a forceful range by David Girard, an experienced scene-stealer whose character is the just the same sort of individual—brilliant casting). A young actor named Thomas Kent comes into his life and transforms Shakespeare when it is revealed that Kent is actually Viola De Lesseps, a beautiful aristocrat who longs to be an actor—this is at a time when women were forbidden to perform on a stage in public. Her zeal and enthusiasm transforms her into the playwright’s muse, then lover, then lead actor playing Romeo. Much of the play he ultimately writes comes close to reflecting her own personal life. The combination of circumstances is entrancing for both of them and a fabulous classic is created out of the chaos that ensues. If you are very familiar with “Romeo and Juliet,” it’s a help, but even if you know nothing, the play works on its merits, so don’t worry too much about the original play—you’ll get the connections that ensue. The two principal actors in this production are Christian Ryan, who plays Will, and Jenny Strassburg, who plays Viola. In the 1998 film that inspired this play, Will was played by Joseph Fiennes and Viola by Gwyneth Paltrow, a pairing difficult to forget. Ryan has the most difficult scene, playing a literary genius who cannot construct a metaphor. The scene basically starts the play, and Ryan played it straight and hard and left a very real feeling for the difficulties of creation. A challenging moment for an actor that perfectly sets up the character, this actor was wonderful with the frustration and gave the director a surreal spot at the start of this fictional look at Shakespeare in the middle of his startling career. 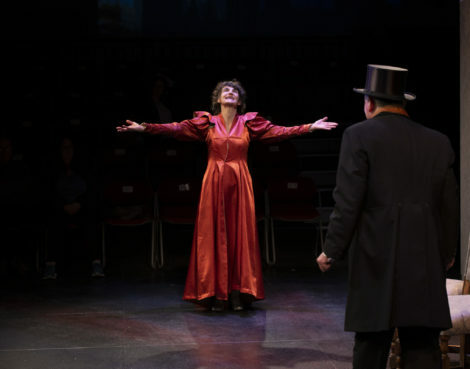 Similarly, the constant quick changes of costumes Strassburg undergoes in the play leave a vivid image of an actress in control of her self-designed characterizations. These two actors make it impossible not to become emotionally involved in their story. Surrounding them are a group of wonderful character actors: men playing men; men playing women; women playing men; men playing women playing men; and so on. It’s rather amazing how quickly the audience at this show can accept the gender confusions, and that is a tribute to the performers, who never seem to be forcing identity in this play. 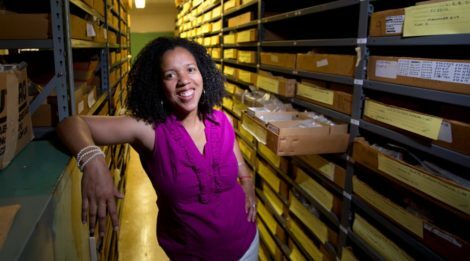 Benita Zahn, for example, as Queen Elizabeth’s mouthpiece Edmond Tilley, is the high-pitched government official trying to do his duty for Queen and country and making a fool of himself in the bargain. She does a wonderful job with this role. Kevin Craig West as playwright Christopher “Kit” Marlowe is a dynamic actor who handles the simple statements with alacrity, his ardor so simple and straightforward that you believe him instantly even though his friendship with Shakespeare is always fraught with competition. John Romeo’s eager Fennyman is both disturbing and funny, and his final appearances are a bit like exclamation points, emphasizing the importance of the arts to the common man. Peter Langstaff as the actor Ralph, who disguises his moustache to play the Nurse in “Romeo and Juliet,” is both funny and sweet. Ellen Cribbs as Viola’s nursemaid is delicious. Casie Girvin as John Webster delivers a perfect portrayal of career frustration in the youth. Joshua DeMarco is poignant as the intended Juliet of the premiere production, and Fred Sirois delivers the Prologue to the play in one of the funniest moments in the entire evening’s entertainment. 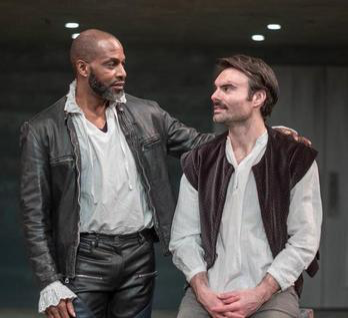 Kevin McGuire, a favorite of theREP, plays Henslowe, producer of the play within the play, with an aggressive sensibility and a disarming humanity as his character’s fate lies in the hands of Shakespeare and circumstances that surround the production. His is a wonderful performance, very human and real, very confused and confounded by everything that befalls him. It is a star turn for a role that is truly a supporting part. Just such a part in this play is that of Queen Elizabeth I, played neatly with strength, force and humility by Laurie O’Brien. The musical maestro is played by Josh D. Smith, whose ensemble of players deliver a wonderful, period inflected score composed by Paddy Conneen (it almost turns the play into a musical). With nine madrigal singers from within the acting company and the 12-string guitar, bodhran, toms, Andes flute, tin whistles and other unusual instruments, the play’s underscore and interim moments really help to keep the action moving and the period of the play specific. Excellent costumes by Evan Prizant, an Elizabethan reminiscent set designed by Lawrence E. Moten III, superb lighting by Travis McHale and seamless sound design by Rider Stranton, the production transports us through the anguish of creation and the bittersweet comedy of real romance under the fine guiding hand and eye of Mancinelli-Cahill. She is aided in this complex work by choreographer Freddy Ramirez, whose work is up to his usual excellent standard, and fight director Joseph Travers, who brings reality into this romantic fantasy. 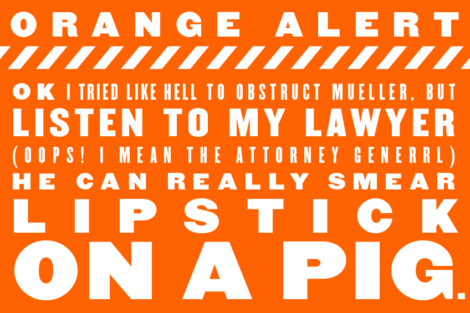 Putting it all together so beautifully makes this a definite don’t-miss play. You only have about a month to catch up with the events of 1593. This play should sell out, so don’t wait the centuries to witness this hand-knit garment of perfection. 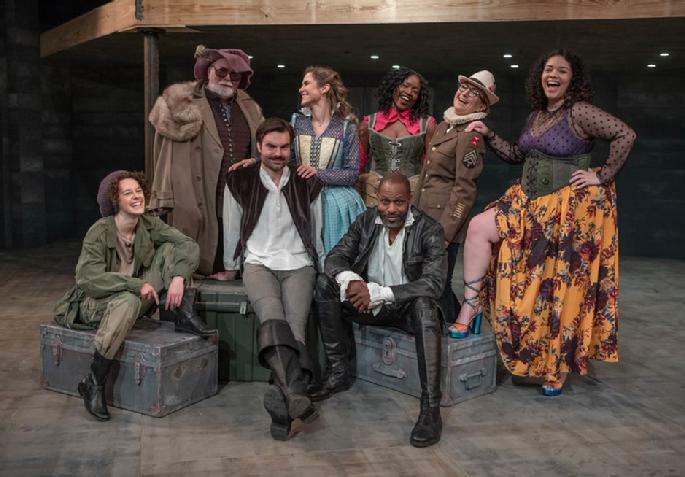 Shakespeare In Love plays at theREP, 111 North Pearl St., Albany, New York, through Sunday, May 12. For information and tickets, see the Berkshire Edge calendar, call the Proctors box office at (518) 346-6204 or go online to capitalrep.org.